(West Yellowstone, Mont.) On January 11, 2014, at 4:14 p.m., the Fremont County Sheriffs Office in Idaho received a 911 call from a group of five snowmobilers who were lost on Two Top due to white-out conditions. The sheriffs office dispatcher was able to get GPS coordinates from the caller’s phone, which showed their exact location. Two Top is located on the Idaho/Montana border southwest of West Yellowstone so 911 calls made in that area frequently go to Fremont County. The Fremont County Sheriffs Office notified the Gallatin County Sheriffs Office who launched a search for the snowmobilers. Personnel from the Gallatin County Sheriffs Office and the West Yellowstone Division of Sheriff’s Search and Rescue responded. The search team located the lost party in nearly zero visibility conditions and escorted them back to West Yellowstone. The lost party consisted of a couple from Helena and three people from Bozeman. One of the snowmobilers was checked by Hebgen Basin Fire Department EMS personnel and released. The other members of the group were cold and tired but did not need medical attention. 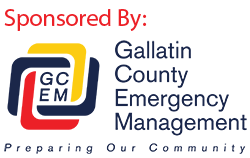 Gallatin County Sheriff Brian Gootkin stated that he can remember when this rescue could have taken all night. The improvement of cellular and 911 center technology over the years has made locating some lost persons much more efficient. This is much better for our rescue volunteers than waiting till 10:00 at night to hear someone is overdue then sending teams out to look for a needle in a whiteout.